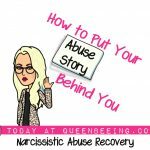 If you’ve ever been in a toxic relationship with a narcissist, you may have experienced various symptoms of PTSD (post-traumatic stress disorder) as a result of suffering from narcissistic emotional and mental abuse. One of the most common issues that my narcissism support coaching clients tell me they have is feeling like they’re “not really here,” as though they’re on a sort of numb-autopilot as they float through life, surrounded by some kind of barrier between themselves and the world. Everything feels sort of foggy and surreal. It’s called dissociation, and while it may have originally started as a way to survive the gaslighting attacks, name-calling and manipulation, it can very quickly become a way of life. Are you aware of how many “automatic” behaviors and habits you have? When you do something over and over, it can reach the point where it becomes a mindless task. You can do a task and finish it, then realize your body worked to complete the project while your mind was actively engaged in something else. Mindfulness can help you learn to be present, to refocus your thoughts so that you’re actively experiencing your life rather than walking through it on autopilot. Sometimes, people assume that mindfulness is a time consuming practice where you have to sit quietly somewhere for a lengthy amount of time. 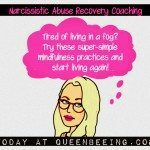 There’s no denying that having chaos in your life is going to happen, and that’s especially true when you’re going through or have recently remove yourself from a toxic abuse situation with a narcissist in a relationship. If you’ve already left, it might not be a constant, but it will happen. When chaos does occur, it puts a lot of narcissistic abuse survivors in a state of anxiety or panic. You know the feeling I’m talking about, right? It’s when you get that knot in your stomach that seems to rise up into your throat and make you feel sick. It’s when you simply don’t know what to do and how to calm the chaos, when you can barely even focus on ANYTHING as a result. 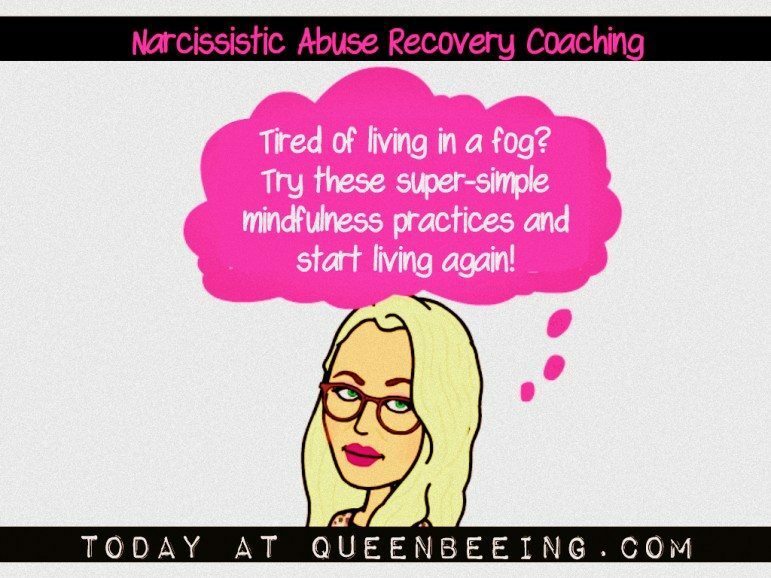 Regardless of what type of chaos you’ve experienced with your narcissist or are going through as you recover, focused, intentional mindfulness can help. It lets you be in charge and not your emotions or your thoughts. But mindfulness allows you to have peace and focus despite the physical or emotional storm you might be caught up in. It keeps you focused on the present and anchors your thoughts and emotions. During turmoil, your mind gets an influx of negative toxic thoughts and when you don’t practice mindfulness, those thoughts then cause the emotions to become more intense. It brings the wayward emotions back to the present and floods your mind with peace and purpose. Mindfulness brings a peace to the negative emotions and thoughts so that you’ll be aware of them, but they won’t control you. So how the heck do you become mindful? There are many simple ways that you can be mindful throughout your day without ever having to take a break from whatever it is that you’re going. Knowing this has helped many extremely busy people to be able to get into the habit of practicing mindful activities. One simple way to practice mindfulness is by brushing your teeth. You do this so often that you probably do it without even thinking about it. Instead of brushing your teeth on autopilot, take the time to focus on the steps involved in this routine. Feel the bristles of the brush as they cross your teeth and tongue. Pay attention to the thickness of the toothpaste of the flavor of it. While you’re brushing your teeth, pay attention to the process and don’t let your mind think about worries or negative thoughts. Another way that you can practice mindfulness as you go about your day is through mindful listening. So many times, there are sounds around you and yet you don’t even hear them because you’re not listening with a focus. Wherever you are, you can take a few seconds to listen to the sounds. You might be able to hear a bird singing, the wind blowing or the distant roll of thunder. You can practice mindful listening with popular music or with instrumentals. Hear each sound and focus on it for a few seconds while tuning out anything but the sound. Mindfulness can be practiced by focusing on breathing. It doesn’t take long and can be done any time of day and in any place. As you breathe, focus on the breath that you’re drawing in. Then focus on the breath that you’re exhaling. Keep your mind centered on the movement of your body as you breathe in the air and release it. Feel the air move within you and tune in to the sensation as you’re going through the exercise. You can practice mindfulness through many other activities including walking, eating, while cooking or cleaning, and even while taking a shower. What do you think? Do you struggle with mindfulness? Share your thoughts and experiences in the comments section. Thank you! While I was married I had no idea narcissist personally even existed. I just thought he was a crazy bipolar jerk. And I accepted I’d feel sad and scared and walking on eggshells forever. 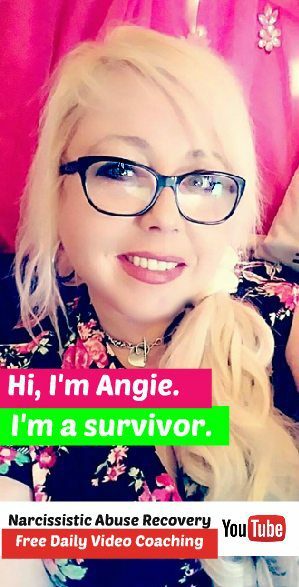 Four years post divorce I’m still “turning back into me” and I think as much as loved ones worry and care and support me, and are proud of how far I’ve come, they have no idea how truly damaged he left me. And how I worry I can never be completely normal again. But life is still good all the time.